Having tried the 14 day Tiny Tea detox March last year, I thought why not treat myself again a year on, experimenting with different brands. 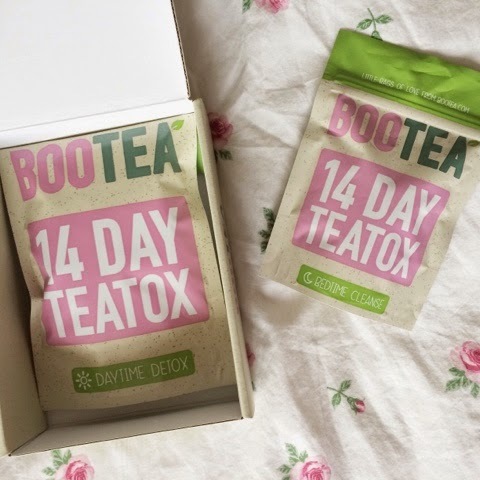 I researched for days trying to find the most effective detox tea and narrowed my results down to BooTea (14 day detox). With it being stocked in my local Holland and Barrot I instantly thought ‘brilliant! It must be decent if my favorite whole foods shop are claiming it’s a best seller!’ Hm.. Not quite the impression I got afterwards. Pros.. It really did give me energy, I felt like I wanted to spend my days outdoors in the sunshine rather than cooped up in bed reading books and blogs, which is a hella’ good sign. I’ve always been one for wasting potentially productive days to John Green (but he’s so worth my time). I felt my skin cleared up for a few days, but then my acne came back in full speed all over my body (which is the reason I purchased this teatox in the first place!). It was pleasant to have clear skin for almost a week but towards the end I was greeted by the most painful blemishes. Cons.. Why in the world has it got such powerful laxative effects! I mean I know it’s kind of a ‘pro’ as all of the toxins are released from your system but it gave you about 5-6 hours to get your day over and done with before needing the toilet I KNOW TMI BUT A REVIEW IS AN HONEST OPINION I DO APOLOGIZE! To conclude, I wouldn’t be repurchasing from this company, I was sadly disappointed but my experience with Tiny Tea last year was wonderful and I will make that my go to detox! I noticed less bloated within 48 hours and lost 3 pounds within 4 days! Unfortunately I have my comparison photos on an old phone and am unable to post them online as the old phone is completely *bleep*. My skin cleared up magically after using Tiny Tea and the customer service from their team was delightful after a series of unfortunate events with my delivery. I have known just two others that have had a similar experience to my own based on the Bootea detox and wanted to know your thoughts and feelings if you had tried it!